With the benefit of hindsight, it’s almost impossible to argue that there is a single more important episode in all of Doctor Who’s long history than ‘The Tenth Planet.’ Aside from introducing the Cybermen, the only alien foe to remotely approach the iconic Daleks in terms of popularity and design, it also gives a glimpse into what would become a staple for the foreseeable future of the franchise, the base under siege format. Most importantly of all, though, it introduces the concept of regeneration (or renewal as it was called at the time) as William Hartnell leaves his iconic role behind. As countless interviews and stories since there have revealed, William Hartnell was becoming increasingly ill and affected by arteriosclerosis, having more and more trouble both meeting the physical demands of the show and remembering his lines. A proud man, these faltering abilities also made him more irascible, and with the declining ratings of the programme a factor as well, the decision was made to bring in a new lead. Story editor Gerry Davis reasoned that, since the Doctor is not human, there is no reason that he might not have the ability to completely change his face and personality. And while the ramifications of this change would be left for the subsequent episode since it occurs at the very end, it’s a ludicrous gamble that paid off admirably and changed the very foundation of the show, allowing it to survive and evolve for more than five decades. As the Doctor slowly succumbs to his death after a three-year journey that saw him go from roguish antihero to sympathetic hero, it’s only fitting that he would go up against a race that has chosen to turn itself into monsters rather than accept death themselves. 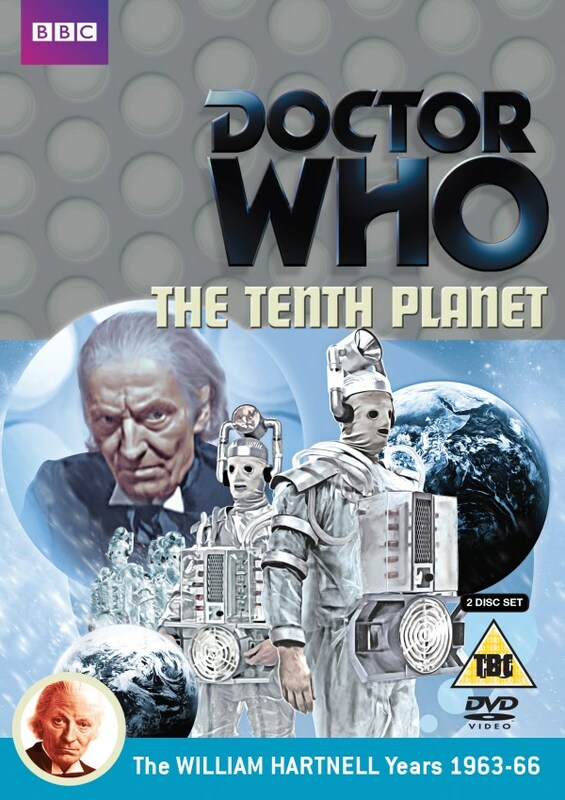 Three of the four episodes of ‘The Tenth Planet’ still exist in the video archive, though it’s agonizingly ironic that it’s the fourth and most vital episode that’s missing. Fortunately, the climactic regeneration scene does still exist thanks to an excerpt from Blue Peter, and the episode as a whole has newly been animated to give a glimpse of what the overall episode would have originally been like. Now traveling with Ben and Polly, the Doctor lands the TARDIS at the South Pole twenty years into his companions’ future in 1986 where they promptly find themselves in an international base guiding a manned space capsule. Unable to explain their arrival, the three travelers are thrust into suspicion even further when the capsule’s two astronauts report that some unknown object in space is pulling them off course and draining their power. This spatial being turns out to be the planet Mondas, Earth’s twin that once shared the same orbit but had since drifted far out into the depths of space before returning. Its inhabitants are the Cyvbermen, one-time humanoid beings who have sacrificed their organic nature and emotions for a mechanical nature in order to survive the increasingly harsh environment deep in space. This concept, as with WOTAN and intelligent computers in ‘The War Machines,’ plays off the fears of the general public at the time incredibly effectively as mechanical implants and prosthetics started becoming more commonly implemented in human medicine. These early Cybermen retain much more of their humanity than later versions and are all the more terrifying for it as they return to Earth to siphon its energy and to convert humanity. In fact, the Cybermen here are seemingly unstoppable, having taken control of the situation remarkably quickly and easily. The power drain from Mondas is a constant threat throughout the story, but the Doctor is able to delay the Cybermen on Earth enough that Mondas remains the biggest threat to itself. Truthfully, a delay is all that the Doctor is able to muster here after quickly declining early on and even collapsing and needing to rest for most of the third episode. There is a suggestion that the Doctor’s decline is also related to the energy-absorbing properties of Mondas, though this is never gone into in any detail and remains an ambiguous thread. Still, despite claiming that he landed at random at the South Pole, he very clearly knows more about the situation than he lets on initially. Even going so far as to write a description of Mondas before it appears to gain the confidence of the base’s staff, the Doctor seems unsurprised as events unfold and continues to casually mention facts that clearly indicate he knows exactly where he is and exactly what he is doing. There are several indications that the Doctor knows he is dying and that he has arrived here with the intent of saving the planet from the Cybermen invasion, in the process absolutely completing his transformation from antihero to hero. This, of course, is never explicitly stated, but it’s difficult to reconcile a random landing with all of the knowledge that the Doctor displays. The final moments of the Doctor’s life- the First Doctor’s life as it is about to become- are remarkably quiet and poignant. There are no grandiose speeches or callbacks to previous adventures or friends. Instead, he simply tells Ben to keep warm after Ben offers him his sweater before mysteriously proclaiming that “It’s far from being over.” Though nobody could have anticipated the gravity of those words at the time, they perfectly encapsulate the essence of the ever-changing character, a fitting and tragic ending to the man who started it all.